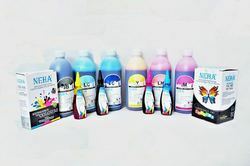 These inks are specially formulated using high quality raw material to offer best print results and long printhead life. Dye Sublimation ink-jet ink is the Water-based ink using volatile disperse dye. After printing on the coated paper for sublimation and dye, the image can be transferred on several sublimate substrates. - Using of 100% purified dye. - Having bright shade and close real black. - Free from smoke and smell during printing and sublimation. Application: Textile, metal, glass etc. Sublimation ink are often written and transferred onto numerous coated media victimization heat transfer machines. 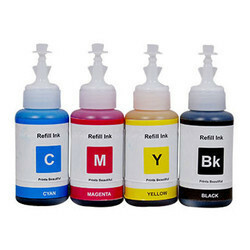 We provides 4 color, 6 color and 8 color sublimation ink for piezo-electric printers. Our sublimations ink are often transferred to bags, coated mugs, tiles, caps, tens, banners, T-shirts, etc. We provide you one stop resolution for digital transfer. Sublimation ( heat transfer inks ) are compatible with Epson L series, Richo print head.